Heat oven to 350°F. In medium bowl, mix flour, 3/4 cup sugar, 2 tablespoons cocoa, 1 tablespoon espresso coffee, the baking powder and salt. Stir in all remaining cake ingredients until well blended; spread in ungreased 9-inch square pan. In small bowl, mix all pudding ingredients except milk; sprinkle evenly over cake batter. Pour very warm milk over sugar mixture. Bake 35 to 45 minutes or until center is set and firm to the touch. If desired, place foil or cookie sheet on lower oven rack under cake to catch any spills. To serve, spoon warm cake into dessert dishes. If desired, top with frozen yogurt and/or raspberries. Pudding cake is a magical dessert. 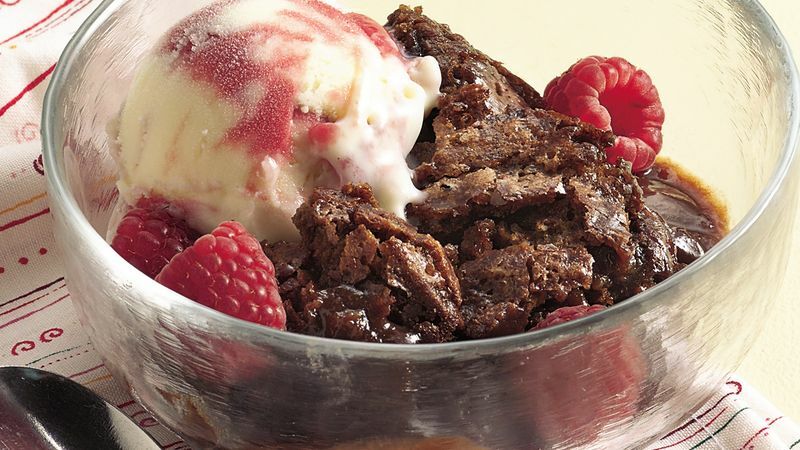 It bakes like a cake, while creating its own pudding-like topping!